Employees of the research company Bkav from Vietnam came up with how to crack the Face ID protection system in the new iPhone X. In the network appeared a video in which the protection of a new smartphone by Apple - iPhone X was cracked. According to the "Komsomolskaya Pravda", experts of the Vietnamese company Bkav, which develops methods of cybersecurity, managed to bypass the identification system of the user Face ID on the first attempt. Must Read: secure u'r facebook to reset u'r password even after u'r account is been hack . To do this, they created the face mask of one of their colleagues, to which the phone was registered. 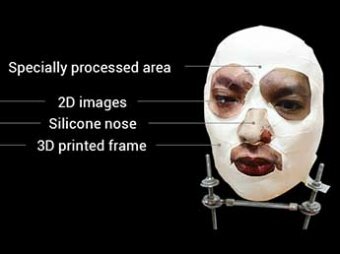 It was made from printed two-dimensional images of the eyes, a silicone nose and a form printed on a 3D printer. The cheeks and the area around the face were also treated. In total, the mask took about 150 dollars. However, making it at home will be quite difficult, since this requires detailed knowledge of the principles of the operation of security systems on smartphones. The face recognition system Face ID appeared in the iPhone X as a replacement for the fingerprint reader's fingerprint ID. Apple is assured that this is the safest of all existing security systems and the probability of its hacking is one to one million. Accordingly, the company does not claim that Face ID cannot be fooled and warn that it will work incorrectly with twins and children under 14 years old, recalls.